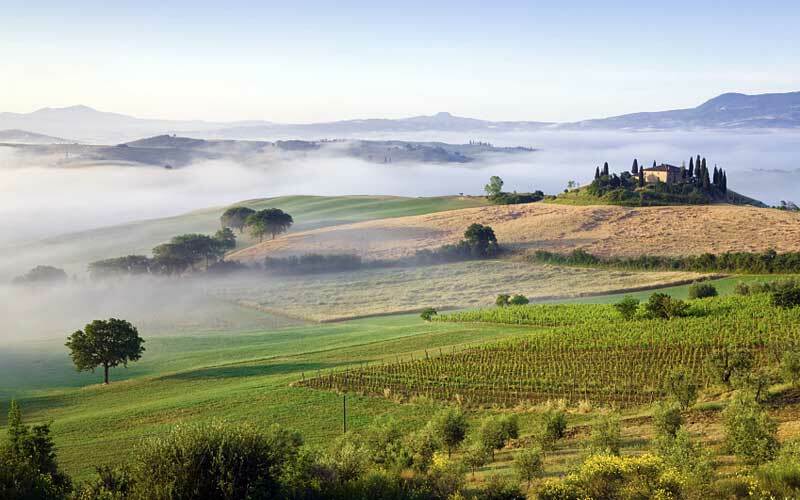 From l'Amorosa follow directions to Torrita di Siena and to Montepulciano, where we suggest you leave your car in one of the paid parking spaces close to the town gates of Porta al Prato (also know as Gracciano), Porta Farina or below the Tribunale (court house). Entering Porta al Prato you'll find yourself in a town the ancient medieval framework of which coexists beautifully with the Renaissance palaces designed by famous architects such as Vignola, Baldassarre Peruzzi, Antonio da Sangallo il Vecchio and Giuliano da Sangallo. Just outside the gate you will find the 14th century Church of Sant'Agnese, complete with 16th century cloister. Within the walls, visitors come across churches dating back to the 13th century such as that dedicated to Sant'Agostino. Strolling through the beautiful streets you arrive in Piazza Grande, the main square and the magnificent centre of the town. The Palazzo Comunale (town hall) will surprise you with it's resemblance to Florence's Palazzo Vecchio. On a clear day, climb the tower for a truly breathtaking view. In the Piazza close to the Pozzo dei Grifi e dei Leoni (well of the gryphons and of the lions) are the Palazzo del Capitano del Popolo a fine example of Gothic art, as well as the palaces of Palazzo Tarugi and Palazzo Contucci both designed by Sangallo and the Duomo, seat of the bishop, which houses a triptych by Taddeo di Bartolo. From here, the return is all downhill. Do make sure you visit the Bottega del Rame (coppersmiths shop) at the number 64 of via dell'Opio nel Corso, where you can watch the centuries-old tradition of copper beating. 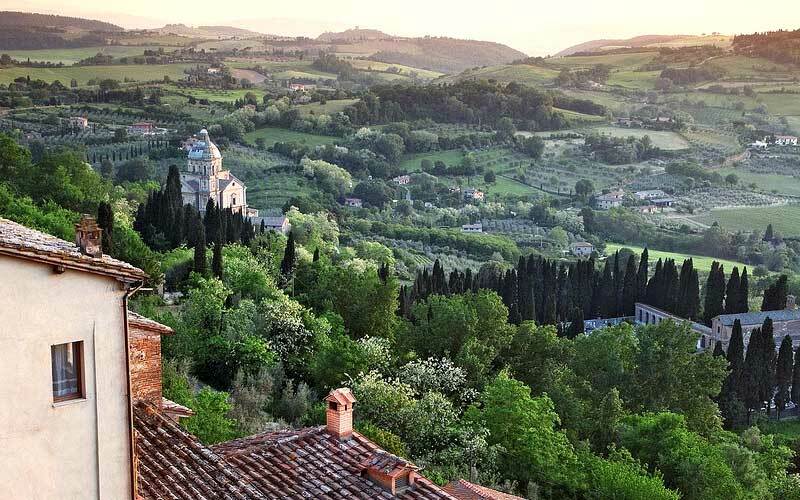 Once back in your car, and before leaving Montepulciano, don't miss visiting (you may stay in your car, but you won't) the Renaissance church of San Biagio, the location of which is romantic at any time but even more so after sunset when it is illuminated. Leaving San Biagio, you will reach a junction at the end of a cypress lined road. Proceed in the direction of Chianciano Terme. After just 1 km , on a curve, turn right for Monticchiello and your first sight of the Val d'Orcia landscape. This small and quaint medieval village deserves a visit. From here you can reach Pienza along either of two roads, one tarmac and one gravel, both enjoyable rides. 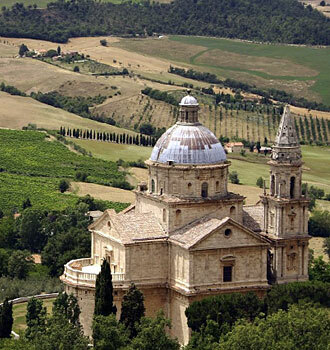 Just before reaching Pienza don't miss the Pieve di Corsignano, a Romanesque church isolated in the countryside, the first recorded mention of which dates back to the year 714. Once in Pienza, we suggest you park in the large car park to the rear of the Consorzio Agrario. 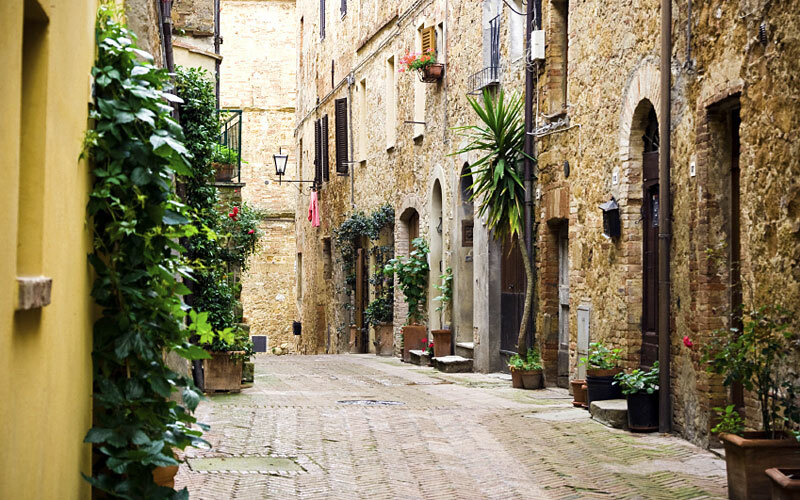 Unlike in Montepulciano, you won't have to climb or walk down hill because the entire town of Pienza lies on level ground. Visit the Duomo, the Museum, and the Palazzo Piccolomini where, in the year 1405, Enea Silvio, the future Pope Pius II, was born and after whom the town was named. On the left side of the Duomo don't forget to walk through the external passageway (camminamento) that affords a beautiful view of the Val d'Orcia. You will cross the via del Bacio (street of the Kiss) and the via dell'Amore (street of Love). If you like wrought iron, before returning to L'Amorosa, don't miss the shop of Fratelli Biagiotti, founded circa 1900, an artisan shop among the most creative and refined of the area.